After two years in early access, Compulsion Games’ We Happy Few, an indie survival game, will finally make its worldwide debut on August 10, 2018. Ahead of the game’s official release, a We Happy Few PSVR experience has been spotted on the PlayStation Store. While it was initially discovered on Australian and European PlayStation Stores, We Happy Few: Uncle Jack Live VR is now available on the North American PlayStation Store as well. It’s completely free. As stated on the PlayStation Store, We Happy Few: Uncle Jack Live VR is “your chance to meet and work with Wellington Wells’ most prominent celebrity figure.” Your job is to assist Uncle Jack and deliver the happiest news possible in the happiest way possible while ensuring all members of Wellington Wells take their Joy, a drug used in the game. You’ll also be tasked with dealing with both Uncle Jack and the Downer Outbreak that’s infiltrated the studio. When you’re done playing the role of producer, you can descend into the media archives and listen to playbacks of over 40 Uncle Jack episodes, jam selections from the official We Happy Few soundtrack, and watch bonus material like trailers, animations reels, and more. It’s worth noting that We Happy Few: Uncle Jack Live VR does not fully explore the themes found in the full game. Instead, you’re placed in a studio and can do little more than talk with Uncle Jack. However, it is connected to the full game, as it allows you to experience the Downer Outbreak front and center via the PSVR. 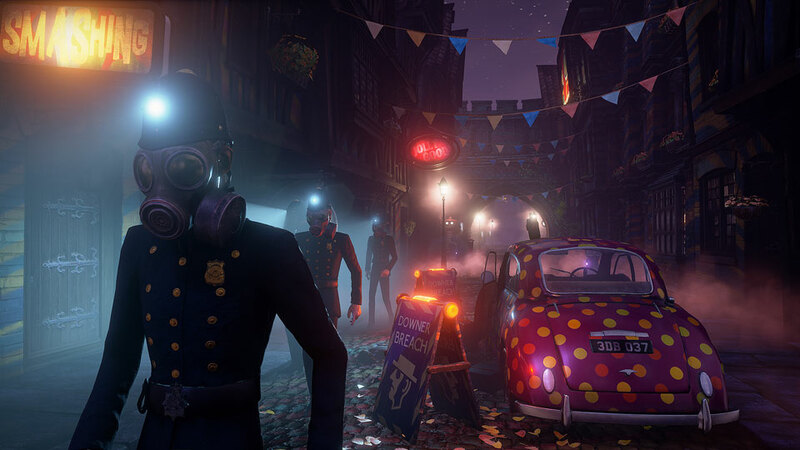 Compulsion Games recently outlined the We Happy Few season pass. It will include three new stories. These are Roger & James in: They Came From Below, Lightbearer, and We All Fall Down. We Happy Few will be available on the PlayStation 4, PC, and Xbox One on August 10, 2018.